This is part 2 of the story about Akiko and Amy. The story starts in part 1. Akiko and Amy are friends. They often go out together during the day. Now, they decide that their husbands should be friends too, so they organise a dinner party. Later, Amy’s mother visits Japan and gives Akiko and Amy an invitation that the two friends cannot refuse! 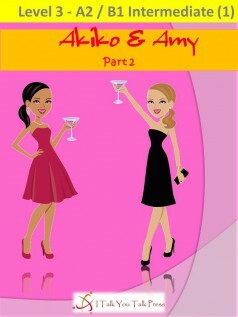 Learn expressions about family life while enjoying Akiko and Amy’s story.